I suppose (no, I am pretty sure) that most of the women while getting ready for the 'big day' are troubled primarily with a wedding gown. Indeed, a wedding dress is the statement of the day. Especially when wearing a floor length gown, less attention is paid on footwear. But on this special day the modern brides want to look perfect from head to toe, so high fashion designer take care of suggesting utterly beautiful bridal shoes. Besides, some creative brides make the shoes as a statement and fit the dress under the footwear. In this article, I want to introduce you to two of the shoe designers well known in the fashion world - Jimmy Choo and Guiseppe Zanoti. In fact, they don't need an introduction, you might have encounter their footwear wrapping the feet of celebrities and royalties. The bridal collections of the designers offer a broad variety from platform sandals to pointy wedge and stiletto pumps. You can choose any style and color fitting your dress and wedding theme. 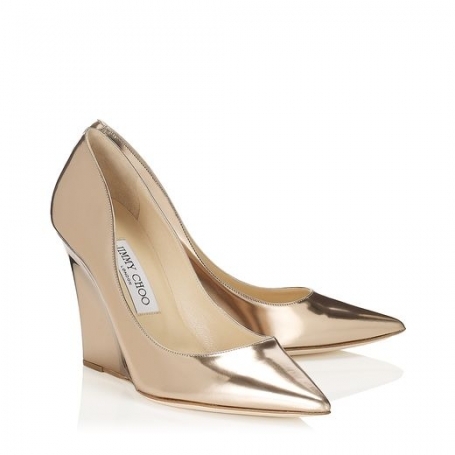 While Jimmy Choo showcase more abstract forms, Guizeppe Zanoti keeps the bridal footwear in a classic style and colors.